Spoof British rapper Ali G is leaving behind the streets of Staines to launch himself on a US audience. Award-winning comedian Sacha Baron Cohen has recorded a six-part series for the US market in the guise of his comic creation Ali G.
Among the unsuspecting celebrities and public figures he interviews are former Democratic presidential candidate Michael Dukakis and right-wing politician Newt Gingrich. He also asks astronaut Buzz Aldrin: "So what was it like to walk on the sun?" Da Ali G Show will go out on the US network HBO from 21 February, and will be shown in the UK later in the year. The show will also feature Baron Cohen's other characters - Borat, a TV reporter from Kazakhstan, and Bruno, a gay Austrian fashion guru. Baron Cohen was forced to ditch Ali G's persona in the UK as a "yoof" television presenter because the popularity of his show meant he became instantly recognisable. Series producer Dan Mazer said: "Fortunately none of the people involved in the US had heard of Ali G so we didn't have a problem." "In this country the character had reached such a saturation point that everybody knew who Ali G was, from eight-year-olds to 80-year-olds." Instead in the UK he transformed the character in to a talk show host, securing guests including David and Victoria Beckham, BBC Radio 4's John Humphrys and Mohamed al-Fayed. In Britain, Baron Cohen duped the likes of Labour MP Tony Benn, Judge Pickles and Conservative politician Sir Teddy Taylor. He stumped Mr Benn by asking: "So do you think people strike just cos dey is lazy and wanna chill for a day or two?" He also featured in Madonna's video for her song Music, and starred in his own movie, Ali G in da House, in which he reached the giddy heights of political power. The film, which did well at the UK box office, could be released in the US if the series proves a success. 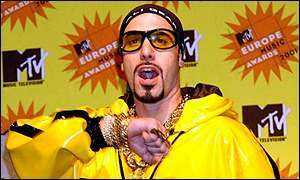 Ali G is also famed for provoking controversy and in 2000 Cohen was accused of racism by some of Britain's leading black comedians, who said he ridiculed black street culture. US TV viewers will also get the chance to see the critically-acclaimed BBC secret service drama Spooks, starring Matthew Macfadyen and Keeley Hawes. The show did come in for criticism from UK television watchdogs over a particularly gruesome scene which left some viewers shocked. When it transfers to America on the A&E Networks channel it will be re-named MI5.